Humour is how the team at Skydive Saskatoon steadies the nerves of those who decide to jump out of a perfectly good airplane. Walking up to the hangar at the Richter Airfield near Martensville, Saskatchewan, the skies suddenly changed from sunny and warm to grey and overcast in the time it took myself and the other three tandem jumpers to sign the necessary waivers and watch the introduction video for our jump. Planning to do a skydive from 11,000 feet, the crew informed us that we were earth bound until the skies cleared – hopefully in a few hours. Reaching out the previous afternoon to Mark Ehrmantraut, one of two owners at the newly opened tandem skydive near Saskatoon, I was surprised and delighted at how quickly they could fit me into the jumping schedule – the next morning at 8:00 a.m. My skydive instructor for the day would be Ehrmantraut’s business partner and fellow skydive aficionado, Ken Adamson. 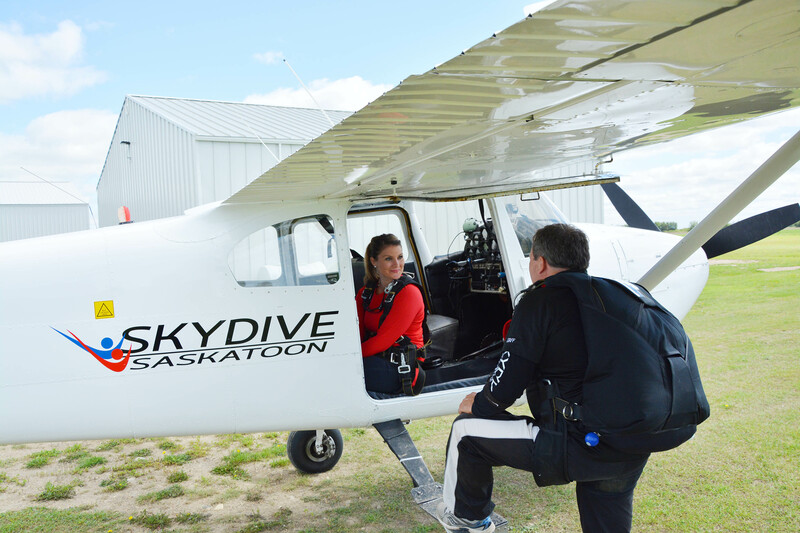 The pair met through a mutual joy of skydiving in the early 2000’s and in 2015 decide to expand Saskatchewan’s skydive business to Saskatoon. 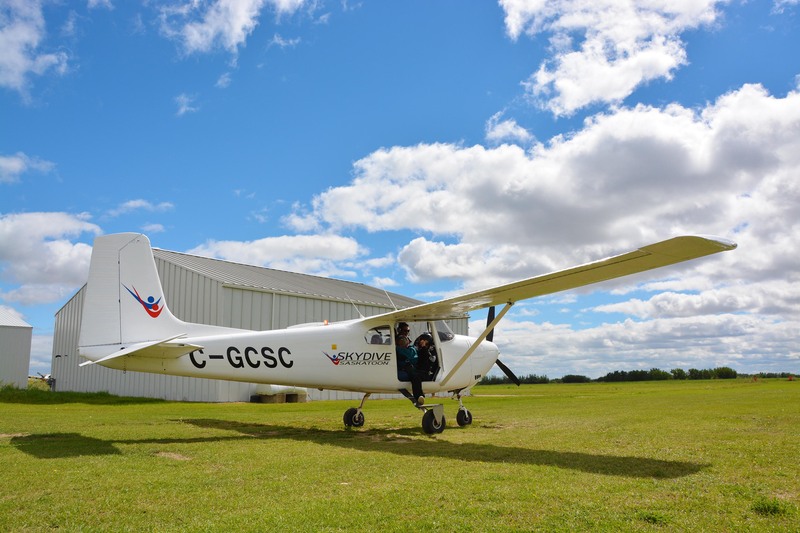 Last year their crew of five helped 130 people get over their fear of heights and launch themselves out of an airplane over the Saskatchewan prairies. This year they’ve already had more than 200 people jump with them. Whiling away the hours till the clouds cleared, the crew entertained us with interesting tidbits on the skydiving community as well as funny stories of previous jumpers, including one jumper who just couldn’t stop crying the entire time – simply an emotional reaction to the adrenaline of the activity. Surprisingly, it’s usually women who initiate booking a skydive, which was true for our morning as the three other jumpers were all female. The youngest jumpers Skydive Saskatoon is allowed to take up must be 18 but the “sky’s the limit” for age (pending no limiting health restrictions). Adamson even took his 82 year old mom up to jump out of the plane. Around 1 p.m the clouds began to break up and we started gearing up for the jump. Ken suited me up in a harness that would later be clipped by four points to his harness and parachute before we exited the plane. Advised to dress for the weather, I knew from a previous skydiving experience that it can get quite cold in the airplane, so I stuck to a pair of pants and a light sweater with comfortable closed-toe shoes. Adamson offered me a pair of safety glasses with a retention strap and walked me outside to the waiting plane to review how the jump would go. Climbing inside the single-engine Cessna, Adamson and I were set to jump second so we tucked into the back of the airplane away from the door. Behind the pilot’s seat is empty “cargo” space where four people can comfortably sit on the floor, each jumper clipped to their instructor. Taking off on the grassy field, I was well aware that there would be no turning back, no changing my mind. Airborne, we circled the landing strip, gaining elevation until we reached our jumping height at 11,000 feet in only 17 minutes. Both Ehrmantraut and Adamson did well to keep our minds off the impending jump by joking around with us and pointing out interesting sites out the window. 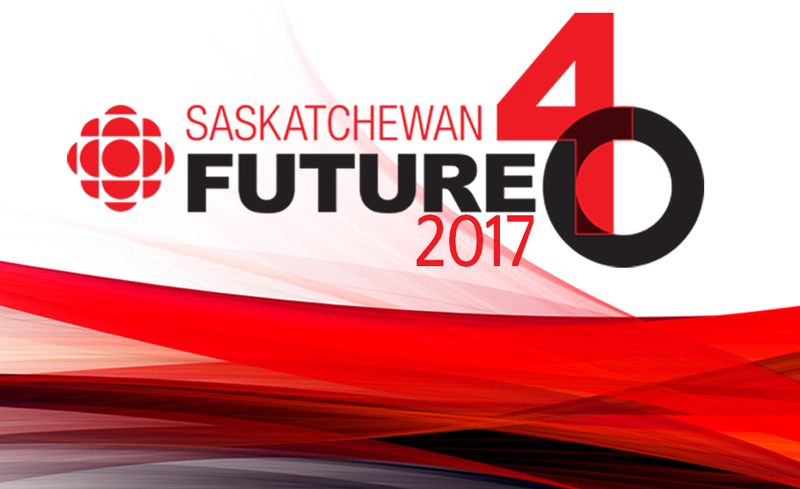 An impressive view of Saskatoon, Martensville and Warman as well as the South Saskatchewan river had me admiring the dozens of acreages dotted around the cities amongst fields of canola, wheat and oats. The spectacular view climbing above white puffy cumulus clouds also calmed my slowly growing nerves. Adamson warned when the door opened reality would set in. At 11,000 feet Ehrmantraut popped the door open and with the sudden gust of wind inside the cabin, my heart sped up and adrenaline spiked. There really was no turning back – only the option of rolling out the small doorframe strapped to a man I put all my trust in. I watched the tandem jumper ahead of me cross her arms, tip her head back to her instructors shoulder and in a matter of seconds roll out the door high above the ground. Adamson and I scooched across and up to the doorframe and I pulled my feet out and across, into the wind onto the frame of the plane. He asked if I was ready and less than five seconds later we were tumbling out in free fall up to 200 km/hr towards the earth. There is little perspective when falling from such heights so the stomach-churning rolls felt on bungy jumps and amusement park rides doesn’t compare. But the rush of wind pushing at your body as you speed towards the ground and the way the air flexes against your skin as you look around for those brief 35 seconds is complete freedom. It’s also one of the most unique feelings in the world. Aside from donning a wingsuit, it’s the closest humans can get to flying. At 5000 feet, Adamson pulled the shoot and we jerked upwards as our free fall speed dropped considerably and by 4000 feet, the chute had fully deployed. Adamson let me grab the secondary handles and asked if I’d like to control the chute. Never one to pass up an opportunity, under his direction, we pulled to the right and the parachute looped us around at a speed that dropped my stomach and can sometimes make people sick. A few loops later, we narrowed in to the dropzone at Richter field and Adamson took back full control of the shoot. Pulling my legs into a horizontal position we smoothly landed in the grass as the chute dropped out of the air behind us. Only six minutes after jumping out of the plane, we were back on solid ground. I couldn’t wipe the grin off my face. 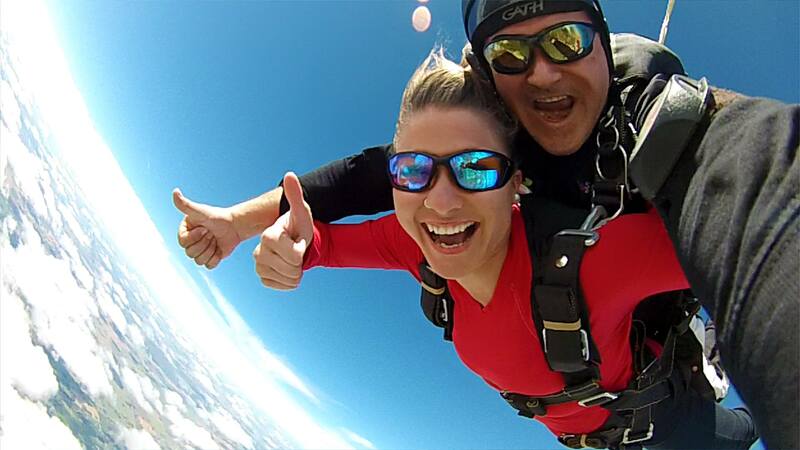 A bucket list item to tick off, the chance to face a fear of heights or simply a short-term fix for adrenaline junkies, the opportunity to jump out of a perfectly good airplane and experience the ultimate freedom with Skydive Saskatoon was truly a once-in-a-lifetime. 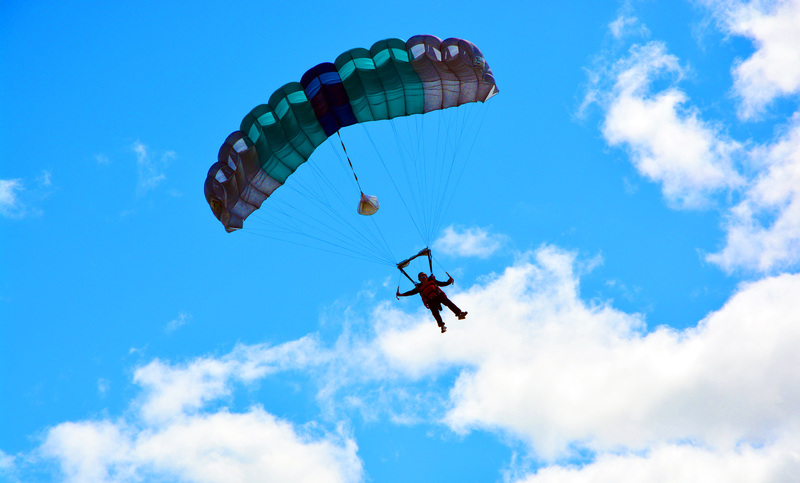 For those interested, Skydive Saskatoon are still booking into September and you can find all the information you need here as well as the contact page here. A big thank you to them for having me out! 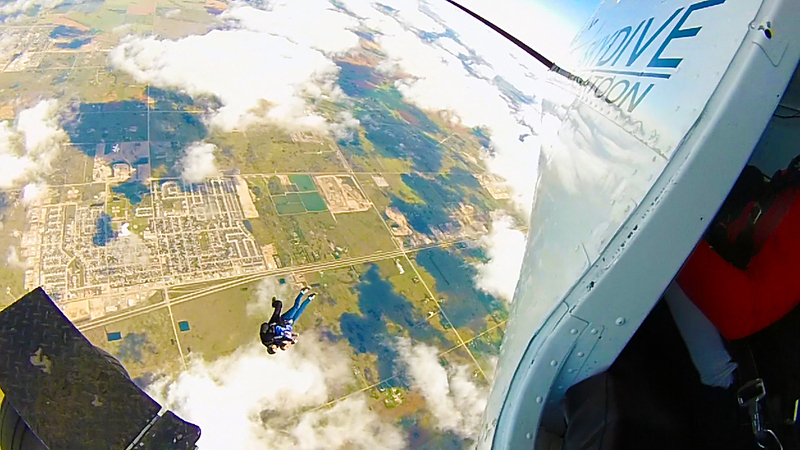 Would you ever skydive? Have you ever? Let me know about your experience in the comments below! This looks like such an adrenaline-pumping and exciting experience! 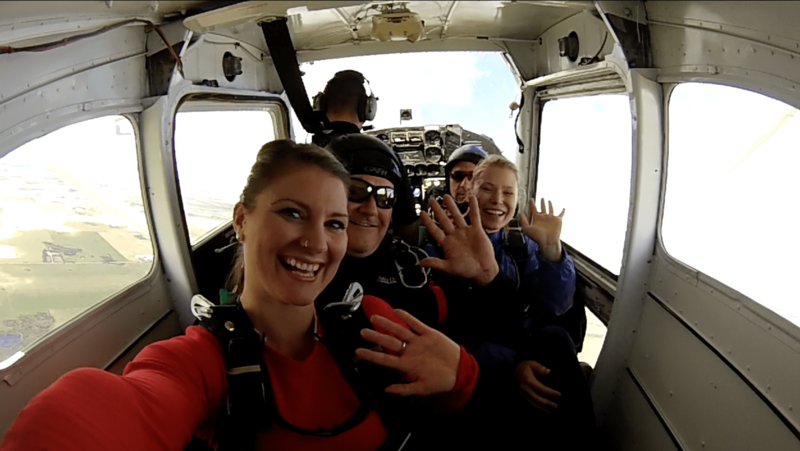 I have never sky dived and don’t picture myself ever doing so (that’s just too far outside of my comfort zone), but I loved reading about your experience. Glad you had fun!